Also includes an aluminum CD. This HDAD+ package contains two discs, one is a two-sided DVD-10 containing two channel 24 bit/192 kHz data and three-channel 24 bit/96 kHz data on one side, playable on DVD Audio players, and on the other side two channel 24 bit 96 kHz data and three channel Dolby AC-3, playable on DVD video players. The second disc included is a standard two-channel CD containing 16 bit/44.1 kHz data playable on all CD and DVD players. Transferred directly from the original 35mm three-track film by Bernie Grundman from Bernie Grundman Mastering and Len Horowitz from History of Recorded Sound at Bernie Grundman Mastering, Hollywood. It has been said that the Fifth Symphony embodies the highest achievements of Prokofiev the orchestrator, uniting an intoxicating many-colored palette with a clean discipline of orchestral development. Nowhere in recorded form have these orchestral colors been captured with such startling fidelity, in large part due to the efforts of Everest as a pioneer in the art of 35mm magnetic tape recording under the supervision of Bert Whyte. 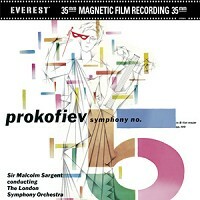 These Prokofiev Fifth sessions were recorded in 1959 at Walthamstow Town Assembly Hall, London with Sir Malcolm Sargent conducting the London Symphony and directly onto three channels of 35mm magnetic tape. The original three track 35mm master tapes were used for this HDAD release.